I just got back from the movie theatre. I went to go see Superman Returns. I had heard some great things about this movie and I had reasonably high hopes myself so I finally decided to go see it today. After seeing it, one word pops into my mind. "Wow". With a side of "You have to see it". Few movies can grab your attention and keep it there for nearly three hours. This movie did just that. The Airplane scene you see in the commercials... let's just say the commercials do it no justice. You have to see it in theatres. The actors were perfect. Brandon Routh was an excellent choice for the character, and played his two characters (the different personalites of Clark Kent and Superman) flawlessly. I don't know if they could've picked a better guy. But before you run out to see it, let me warn you, this is not an action flick. Don't go there expecting non-stop action, because that's not what this movie is about. But, while few in number, the action scenes are incredibly well directed, with just the right amount of tension to keep your eyes glued to the screen. In summary, go see it. It's an excellent film, and one that should not be missed for fans of Superman and the old movies starring Christopher Reeve. Director Bryan Singer and his team have succeeded in creating an excellent (I seem to be using that word a lot) spiritual successor to the classic films. I am amazed. As I said before, I knew it was going to be good, but it blew me away. it ranks up there with Batman Begins as one of my favorite movies of all time. Go see it. I can't say that enough. I don't know what it is about DC comics but they seem to make great movies. It's after 1 AM here. I'm bored. So I decided to make a quick blog post. If you own a DS, this game should be in your collection. No ifs, ands or buts about it. I'm addicted to it. Sure, the concept borders on homework, but somehow, this "game" (I use quotes because it's not really a game in the conventional sense) actually makes me want to do math problems. As soon as I discovered that my “Brain Age” was 32 (actually, at first it was 59 then I got it down to 37 and now 32), I immediately got to work doing some of the many training exercises. The Ideal Brain Age is 20 and that’s what I’m aiming for. I’ll have a review posted on this game soon. When I walked into EB games, the bargain bin caught my eye. I was drawn to it like a moth to a flame. As I began sifting through the games, Breakdown caught my eye. In last months OXM, there was a list of the 20 most overlooked Xbox games. Breakdown was among the top three. As soon as I saw it and the price ($6.99) I had to have it. So I took it to the counter and bought it, along with my copy of Brain Age. The clerk asked me if I wanted to purchase the $1 warranty on my new copy of Breakdown. I didn’t hesitate to say yes. It was only a buck. Boy, am I glad I got that warranty. When I got home and popped the game into my Xbox, I hadn’t even looked at the surface of the disc. My Xbox gave me a message about how the disc was unreadable and was likely scratched or dirty. I took the game out of my Xbox and looked at it. It was scratched to hell. How did the person that traded it in manage to get EB games to even take it in this condition? I immediately started trying to clean the disc using a combination of water and my T-shirt. No luck. I began to frantically search for the receipt, which also had my warranty information on it. I couldn’t find it anywhere. I ran out to the car, frantic, hoping that I didn’t just waste seven dollars (eight with the warranty). There the receipt was, sitting on the seat. I breathed a sigh of relief and proceeded to take the game back to the store to get a working copy. The game was cheerfully replaced and I went home happy, thanking my lucky stars that I bought the warranty. The game itself is awesome. I don’t know why it didn’t sell better than it did. It’s sort of a First person shooter / fighting game that takes place entirely from the First Person perspective, even the cutscenes, which I have to say, are done incredibly well. I’m about an hour into the game now and I’m amazed. The controls are a bit strange, but aside from that, I don’t have any other complaints. While I was in EB Games, I managed to get my hands on the new Nintendo DS Lite and play a little bit of New Super Mario Bros as well. The DS Lite really is small, but despite its smaller size, the dual screens themselves don’t shrink in size (in fact, due to the DS Lite’s proportions, the screens actually seem bigger). The face buttons have a more satisfying feel to them. The original DS (often called the DS Heavy or the DS Phat) face buttons have a “clicky” feel to them, like on a cell phone keypad. They don’t have the satisfying “give” that the DS Lite has. 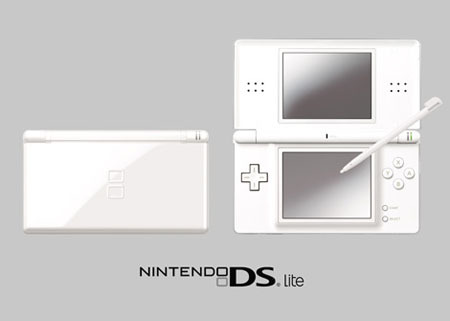 The Ds Lite is certainly more attractive, and I will soon buy one for myself. As for the game, I enjoyed New Super Mario Bros. It brings back memories of the old school side scrolling games and somehow manages to feel fresh at the same time. This will probably be my next game purchase. Well, that's it for my (not so quick after all) blog post for today. I'll post more updates soon, including a list of the most criminally overlooked games last gen. That I didn't feel like posting at the moment. This is a little late but, The Miami Heat defeated the Dallas Mavericks in game six to win their fourth game in a row and their first NBA champoinship. Oh well. The Mavericks tried but in the end, the Heat was a little too much for them. I guess there's always next year. GO PISTONS! Time for another rant about HDTV's and stuff. Before I get into the topic at hand, I want to let you guys know that I have posted a few more reviews. I have a new primary reviews site, as Gamespot is a bit more user friendly and I seem to be getting more feed back. I also have a secondary blog there. It has some stuff that I didn't really feel would fit into the theme of this blog (even though it's about gaming). The link is still in the "links" section as it always was. Oh and by the way, The Miami Heat beat the Dallas Mavericks to win their third game in a row and put them one game away from winning the NBA Championships. Those games were so close. There was no way they should've lost. I'm hoping Dallas can win games Six and Seven and win the NBA championship (and of course, put an end to The Miami Heat's season). Onto the topic, after seeing pics of Xbox 360 games on a High Definition TV in this message board, I can't wait any longer. This summer I will be picking up an HDTV for sure. Now it's only a matter of how early I can get the money. Here are a few models I've been considering. As you can see, I'm not really interested in a huge screen. I don't want or need anything bigger than 32 inches at the moment and these fit the bill perfectly. I plan on taking my Xbox 360 into a Best buy or Circuit City store to test out the different HDTV types to see which one works for me. Personally, I'm leaning towards an LCD TV for the time being. before now, I was thinking about getting a CRT TV, which is generally cheaper and in some cases, have the best picture quality of all the HDTV types (Plasma, DLP, etc.) They don't get much bigger than 36 inches, but that wouldn't be a problem at all. Only problem is, CRT's are huge. The ones over 30 inches can weigh in at over 200 pounds. There's a whole bunch of technical reasons to pick one over the other but it's far too complicated to get into right now. Too bad they're so expensive. 1000+ dollars isn't chump change, especially to me, with the rising gas prices and such. Gotta make sure my money is well spent. I'll post more updates later as I close in on the HDTV of my choice. I want to start off my rant with some terrible news. The Pistons were eliminated last week by the Miami Heat in game 6 of the Eastern Conference Finals. Damn. All I want to know is, what the hell happened? The Pistons had the best win/loss record of any team in the league last season, but they had a very terrible (in comparison) playoff performance. After eliminating the Bucks in round one, they seemed to fall apart. They had one blowout game against the Cavaliers, won again by a much smaller margin and then the next thing you know, we lost three in a row and faced elimination. What the hell? We are talking about the Cleveland Cavaliers right? The Pistons should've swept them. Anyways, we came back in game six and seven to win the series after two straight wins but we were still sliding downhill. After losing game one to the Heat, we won one and lost two in a row, won one, and were subsequently slaughtered in game six and eliminated. The Pistons had a 3-1 record against the Heat in the regular season, and all those games were away from the home court. What the hell happened? All I can say is that the Heat wanted it more. Perhaps the Pistons were tired. They sure looked that way. The Memorial Day game was ridiculous. The Pistons came back in the third quarter and took the lead, and slowly lost it as the game went on. I'm not sure of the exact score but I think we lost by nearly 20. Oh well, I guess there's always next year. Good luck to the Dallas Mavericks in the NBA Finals. I'll be damned if I'm going to be rooting for the Heat. I'm going to place a permalink on the side of the page soon (past midnight right now, tired as hell) Now I have to find some cheap webhosting. Okay, it's officially past 1 AM now. I think I'm going to wrap things up. I'll be back with another post soon.